The Axiohm A760 is one of the fastest two-color hybrid printers on the market, and offers integrated MICR and check flip. The A760's flat slip table remains the most accurate and user friendly way to print checks and multi-part forms. The A760 also offers standard monochrome printing. Thermal & Impact, two-color receipt & slip printing, USB & serial interfaces. Includes MICR, power supply, & auto-cutter. Order cables separately. See accessories. Color: Dark gray. Thermal & Impact, two-color receipt & slip printing, serial interface. Includes MICR, power supply, & auto-cutter. Order cables separately. See accessories. Color: Dark gray. Thermal & Impact, two-color receipt & slip printing, USB & serial interfaces. Includes power supply & auto-cutter. Order cables separately. See accessories. Color: Dark gray. Thermal & Impact, two-color receipt & slip printing, serial interface. Includes power supply & auto-cutter. Order cables separately. See accessories. Color: Dark gray. 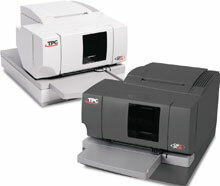 Thermal & Impact, two-color receipt & slip printing, USB & serial interfaces. Includes MICR, power supply, & auto-cutter. Order cables separately. See accessories. Color: white. Thermal & Impact, two-color receipt & slip printing, serial interface. Includes MICR, power suppy, & auto-cutter. Order cables separately. See accessories. Color: white. Thermal & Impact, two-color receipt & slip printing, serial interface. Includes auto-cutter. Order cables & power supply separately. See accessories. Color: white. Thermal & Impact, two-color receipt & slip printing, USB & serial interfaces. Includes auto-cutter. Order cables & power supply separately. See accessories. Color: white.